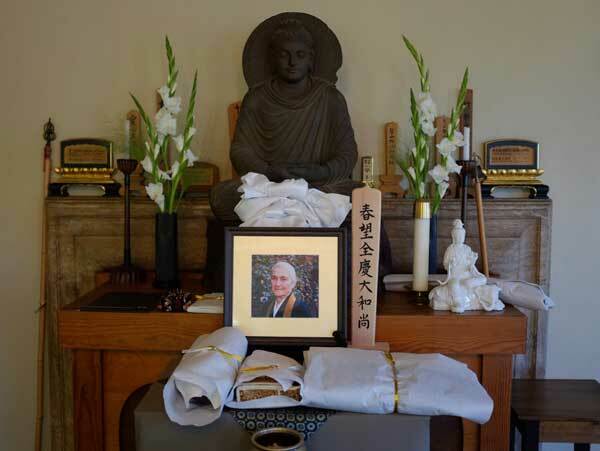 Bodhisattvas/Angels – Relating to Cancer, the last dharma talk given by Lee Lipp, was on April 27, 2016, at City Center. You can listen here. Here are some photos of Lee Lipp by Shundo David Haye. 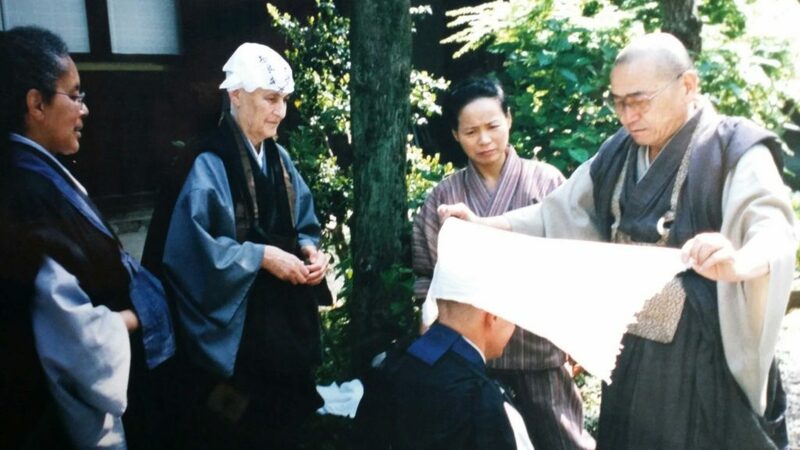 Lee, center, in the City Center courtyard with her Shuso’s fan after her Shuso Ceremony in 2013. 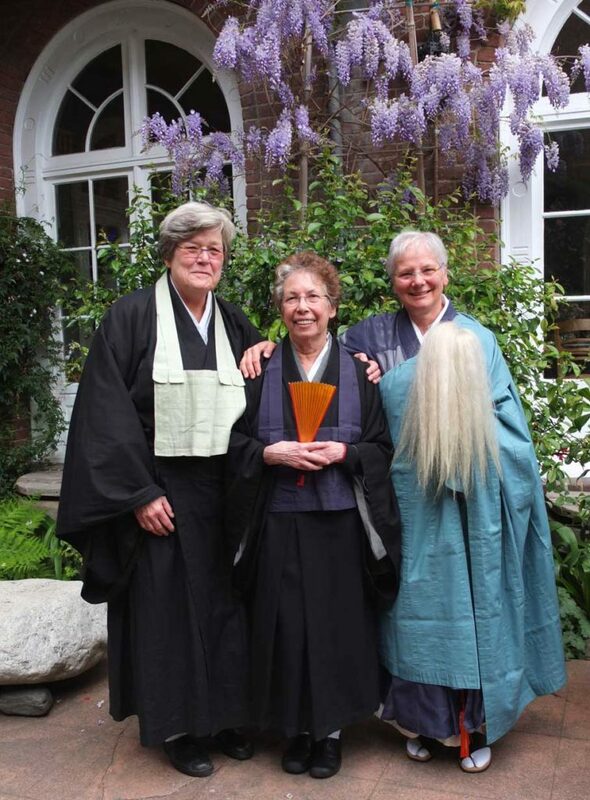 With her are, left, Marsha Angus, and right, then-Abbess Kiku Christina Lehnherr, who led the practice period. Photo: Shundo David Haye. 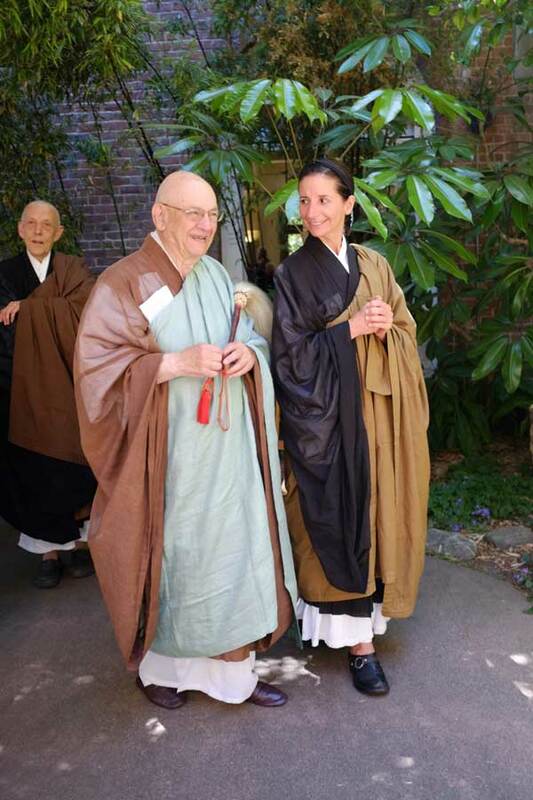 Lee with her dear friend David Zimmerman, left, after her Shuso Ceremony in 2013. Photo: Shundo David Haye. The mind of the great sage of India is intimately transmitted from west to east. While human faculties are sharp or dull, the way has no northern or southern ancestors. The spiritual source shines clear in the light; the branching streams flow on in the dark. Grasping at things is surely delusion; according with sameness is still not enlightenment. All the objects of the senses interact and yet do not. Interacting brings involvement. Otherwise, each keeps its place. Sights vary in quality and form, sounds differ as pleasing or harsh. Refined and common speech come together in the dark, clear and murky phrases are distinguished in the light. Fire heats, wind moves, water wets, earth is solid. Thus with each and every thing, depending on these roots, the leaves spread forth. Trunk and branches share the essence; revered and common, each has its speech. In the dark there is light, but don’t see it as light. Light and dark oppose one another like the front and back foot in walking. Each of the myriad things has its merit, expressed according to function and place. Phenomena exist; box and lid fit. Principle responds; arrow points meet. Hearing the words, understand the meaning; don’t set up standards of your own. If you don’t understand the way right before you, how will you know the path as you walk? Progress is not a matter of far or near, but if you are confused, mountains and rivers block your way. I respectfully urge you who study the mystery, do not pass your days and nights in vain. Vanished the labor, here bells are. table with peelings of grapefruit and sweetness. 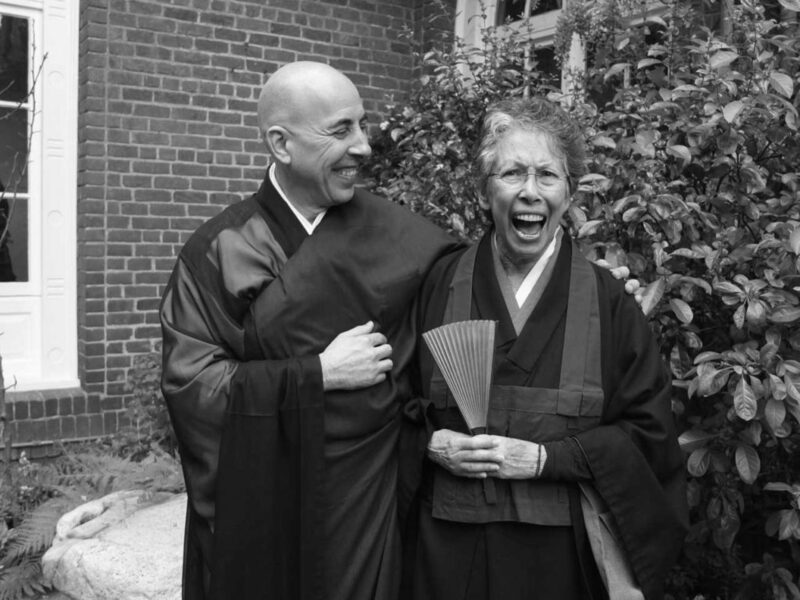 Blanche, you were, with Lou, my Zen godparents, the ones who first welcomed me into this sangha. 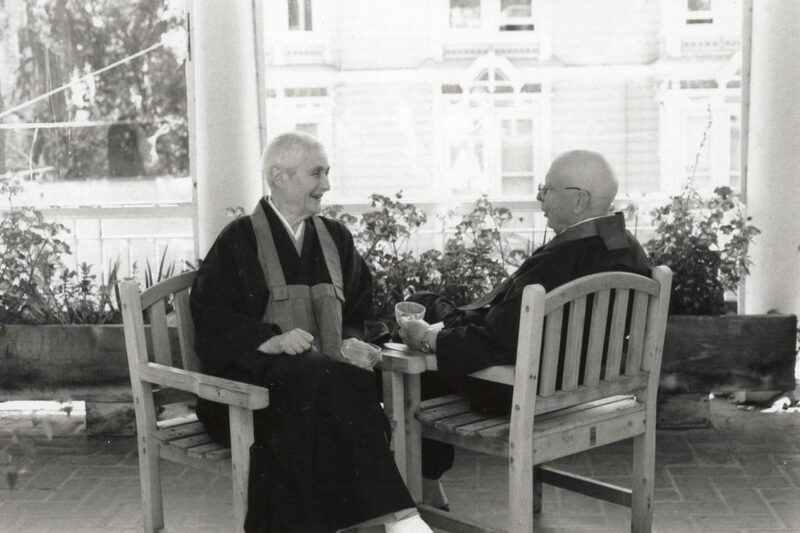 You were the head of my dining room crew at Tassajara, and in later years the warm supporter of my practice with words, the kind and steady witness of it as a path. You practiced with us undisguised. When I last saw you, at Age Song, you were discouraged, and so I told you a story of Katagiri Roshi when he was dying. 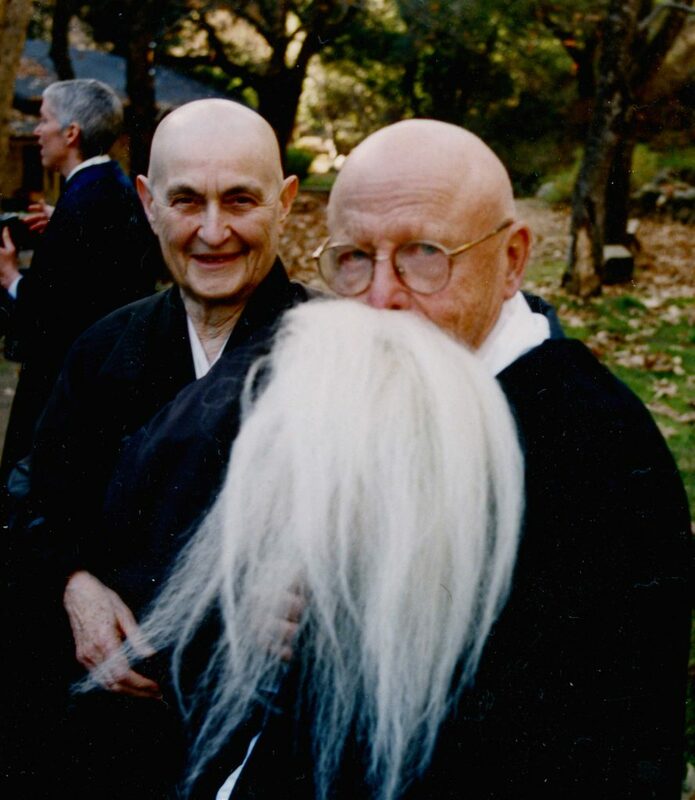 You answered me with one about Suzuki Roshi. Asked if he was afraid of dying, he said, “I know who I am.” Thank you for practicing with us as yourself. Thank you for your great kindness. 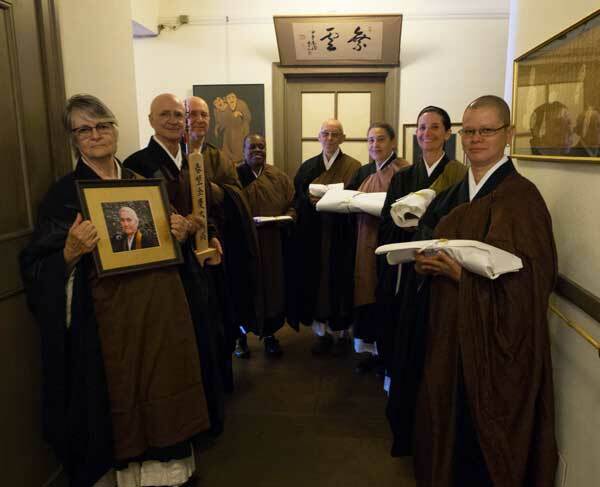 Lined up before the procession to the Buddha Hall, in the hallway outside the room where their teacher once lived, Zenkei Blanche Hartman’s dharma heirs carry the items that represent her: Seirin Barbara Kohn with her portrait; Kosho McCall with her ihai; Tony Patchell with the staff; Zenju Earthlyn Manuel with the book of Zenkei’s teaching that she edited, Seeds for a Boundless Life; Junsei Jana Drakka with her “sammotsu” transmission documents; Ryumon Baldoquin with her robe; Myozen Joan Amaral with her bowls; and Keiryu Liên Shutt with her whisk. 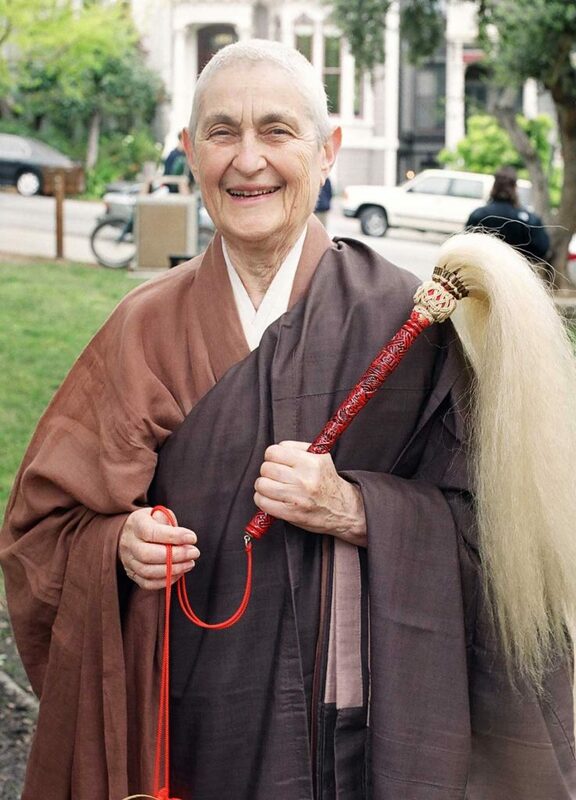 Photo: Renshin Bunce (who was also part of the procession, carrying Zenkei’s pincushion). Zenkei’s daughter Trudy Hartman speaks to the assembly. Photo: Shundo David Haye. 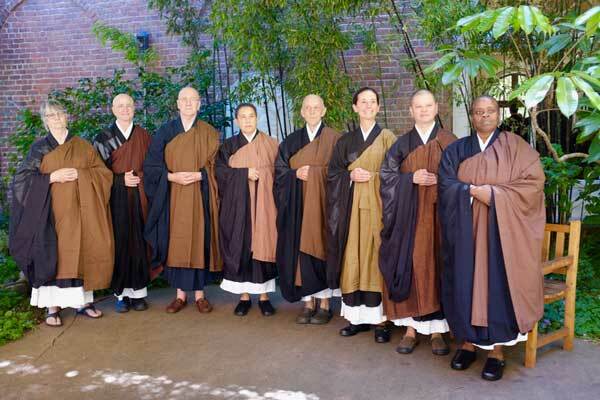 The dharma heirs in the courtyard afterwards: Seirin Barbara Kohn; Kosho McCall; Tony Patchell; Ryumon Baldoquin; Junsei Jana Drakka; Myozen Joan Amaral; Keiryu Liên Shutt; and Zenju Earthlyn Manuel. Photo: Shundo David Haye. 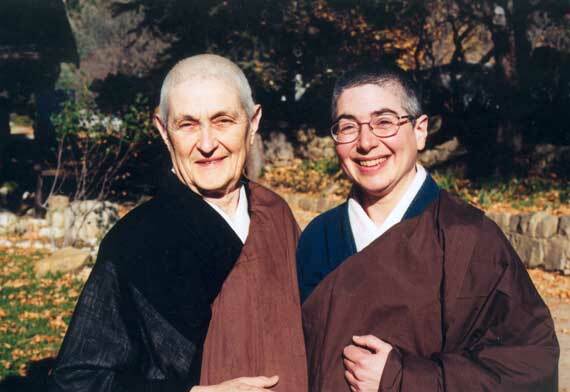 Sojun Mel Weitsman with Myozen Joan Amaral. Junsei Jana Drakka can be seen behind Sojun. Photo: Shundo David Haye. 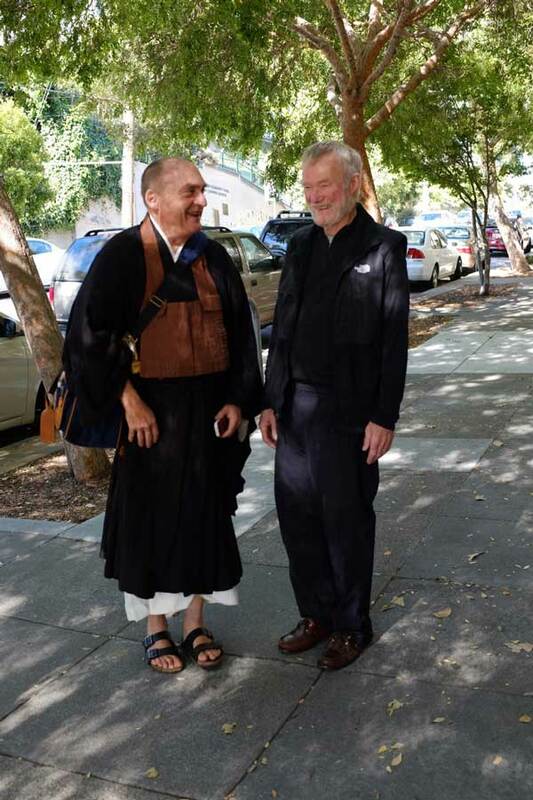 Edward Brown and Gib Robinson on the sidewalk outside SFZC after the funeral ceremony. Photo: Shundo David Haye. The altar after the ceremony. On the right is a statue of Zenkei’s favorite bodhisattva, Samantabhadra. Photo: Shundo David Haye. 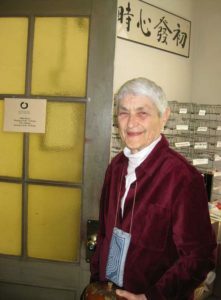 Blanche in the City Center front office in 2008. 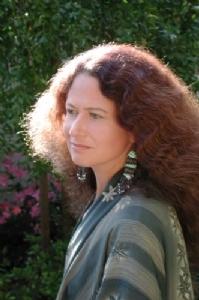 As a child, Blanche Gelders hung out with her dad. He taught her to be handy. They had a Model T Ford pick-up and a fire started in it. He tried to fix it and got frustrated, saying to Blanche, “If you can fix it, you can have it.” She did fix it and drove it, but things kept going wrong with it and it needed lots of upkeep. There was a rumble seat, and gas for the car was under the front seat. Eventually Blanche traded it for a 1939 Chevy. 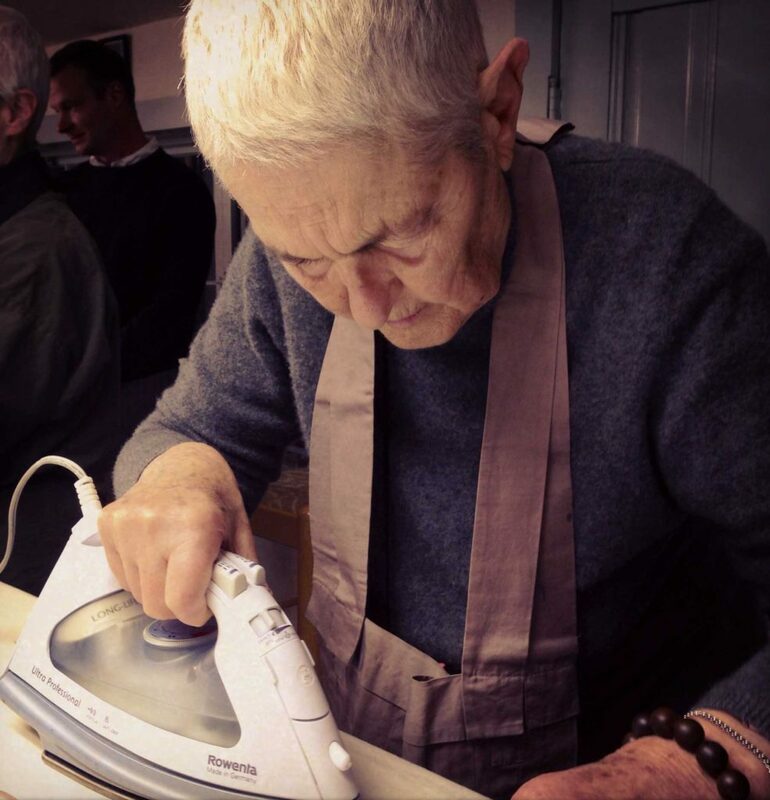 When she was young, Blanche was a tomboy and enjoyed spending time in her father’s workshop. Her mother didn’t mind—she was feminine enough for two and was very beautiful. Blanche was allowed to take shop in school, but also had to take sewing. They were supposed to make a wool skirt or shirt, but wool was very expensive (this was during the Depression). Blanche’s sewing teacher didn’t want to waste the wool on Blanche, so she let Blanche take care of the sewing machines instead. Blanche always loved to sing, which might have started when she was in the Girl Scout chorus as a child. They lived in Alabama (her mother and father were from Alabama) until Blanche was 10, when they moved to New York for a brief time—her dad was there for civil rights work. They returned to live in the Birmingham area. During World War II, he was in the Army Signal Corps and stationed in Davis. Blanche’s sister often didn’t want her younger sister tagging around. 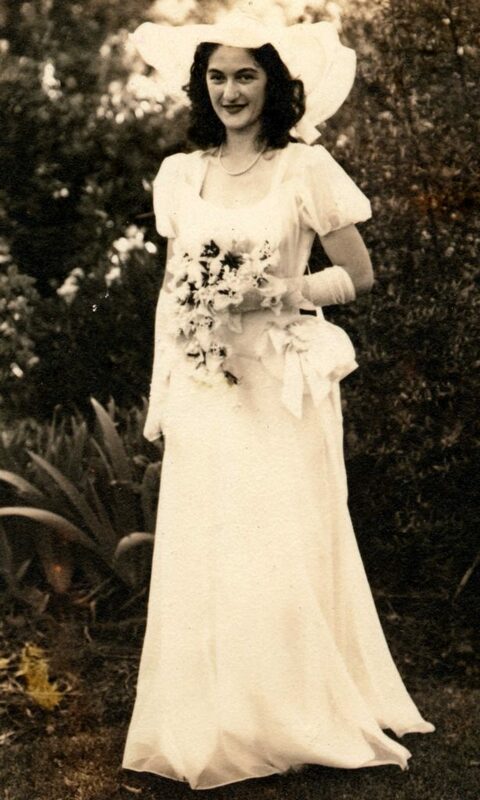 Marge was very intelligent—she graduated from high school at 16 and got a full scholarship to Radcliffe. 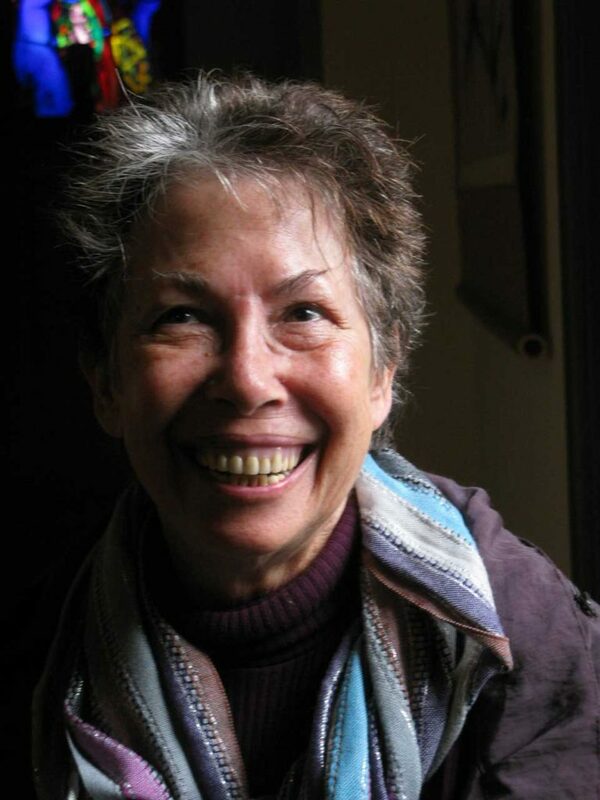 She taught in the first Women’s Studies Department at Santa Cruz. Blanche came to feel better towards Marge after she found a copy of her sister’s autobiography. In it, Marge spoke very fondly about her younger sister. Blanche went to college at UC Davis, which was then much smaller that it is now. She went to Berkeley for summer courses—things she couldn’t get at Davis. Her idol was Lou Hartman, who did a radio show based in Berkeley. He would sing: I Will Love You Till the End of Time. So she always managed to be near him (“in his face”, she said), but he didn’t notice. At that time Lou was writing a play about the Spanish Civil War and needed someone to play a Spanish girl. Blanche looked the part and so she was drafted. There was also a veteran of the Spanish Civil War involved with the production as an advisor, and all the girls had a crush on the idea of him (a veteran of that conflict was a very stylish thing to be in communist circles in the forties). Blanche was confused, and thought that Lou was the veteran, so she developed a crush on him. Later, she found out she was wrong, but she stood by her crush . The veteran wasn’t actually attractive, she said. 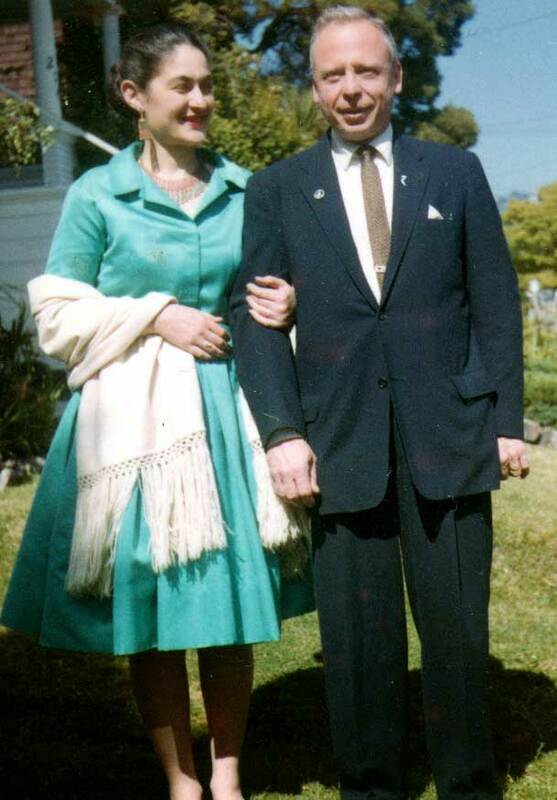 Lou was 30 and had been married before to Marjorie, who wanted children. Their first child, Landis, was developmentally disabled and needed to be institutionalized, and the second died at birth. This was found to be due to a rare chromosomal abnormality passed through the mother, but Lou didn’t know that at the time and was concerned about having children. Lou and Marjorie were no longer married at the time Lou met Blanche. Not long after he told Blanche about his past, he sent her a letter of proposal. The next time he saw her he asked her what she thought of his letter. She said that it was kind of sudden. She went to ask her father what to do and he said, “Whatever you decide is right. If you decide to get married, you can make it work.” And she decided to marry Lou. 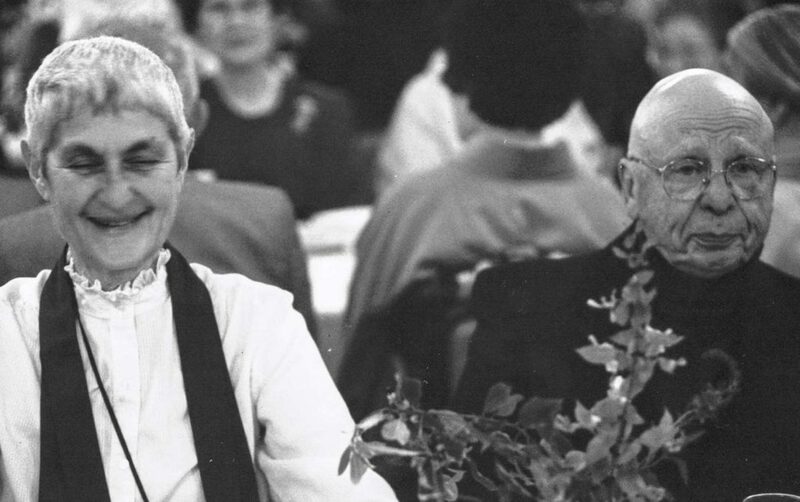 Blanche left UC Davis after she married Lou. Her father died of a heart attack when he was 50—and when Blanche was pregnant with her eldest son. They named him Joseph Gelders, after her father. When they had children, Lou would help at their co-op pre-school. He came home exhausted because so many boys who didn’t have their fathers wanted to play very vigorously with him. He had been a restaurant cook and liked to cook for both of them and for guests. A barbecued leg of lamb was a favorite of his. Blanche became a chemist and originally worked for a company that made ink. When she found out that the men were being paid more than the women there for doing the same job, she quit and went back to UC Berkeley to finish her degree. She graduated when her daughter, Trudy, was 10. She then became a bio-statistician, which was a very new field. At a certain point she went into civil service. There, she analyzed levels of lead in the blood of people who lived near freeways, to see if it might be greater than the norm. But she discovered that men were also paid more than women for doing the same job in civil service. 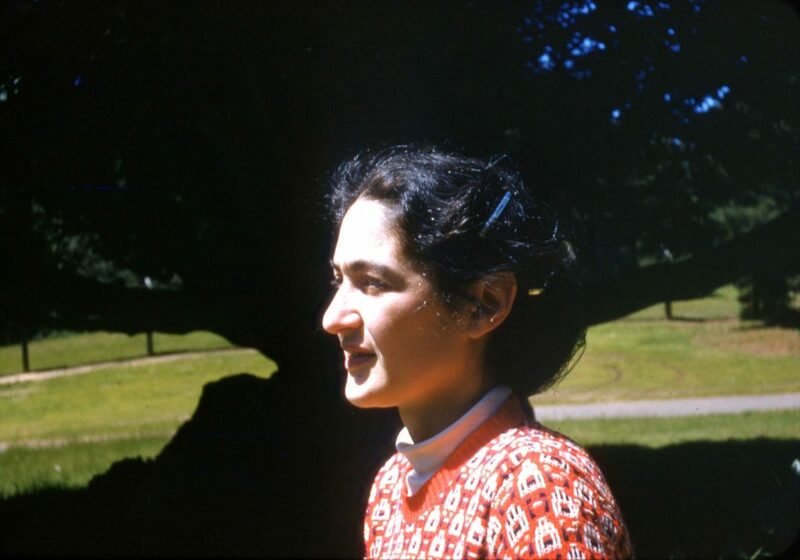 Blanche was a bit older than the other students when she was at Tassajara. She wanted to be liked by them and would make them ice cream. That was in the days when dry ice was used and one time it was too hard and students and staff were upset. 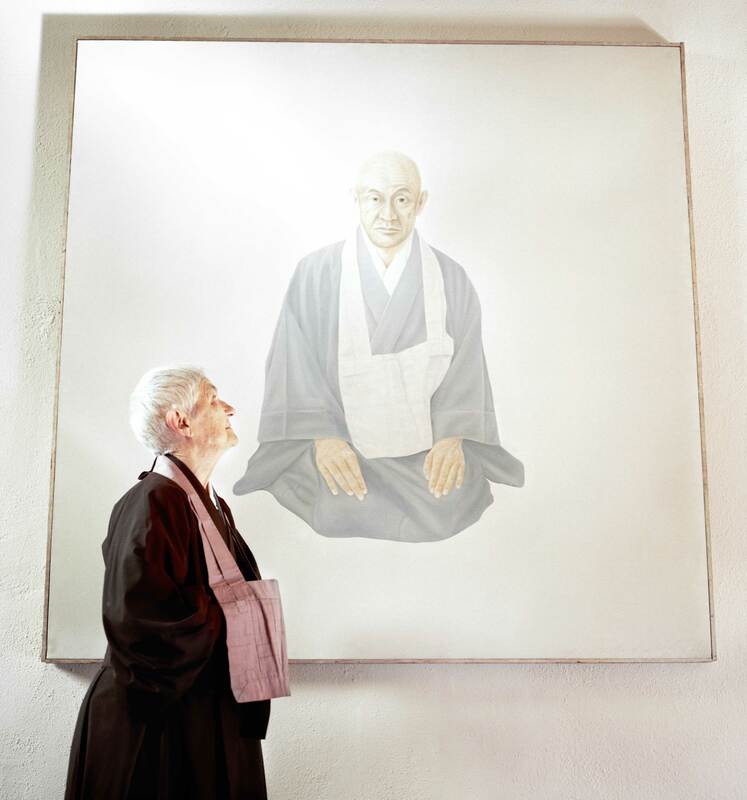 Blanche then wanted to be Tenzo (head cook) to get over her “needing to be liked”—it was impossible to serve food that everybody liked, and it was a practice in not taking criticism personally. She found herself putting out coffee and tea on a tray to make it easier for the students. She noticed students ordering peanut butter and so made sure there was peanut butter at the back of the kitchen snack area. She also helped with getting students access to hard-boiled eggs. Vicki’s article can be read here. 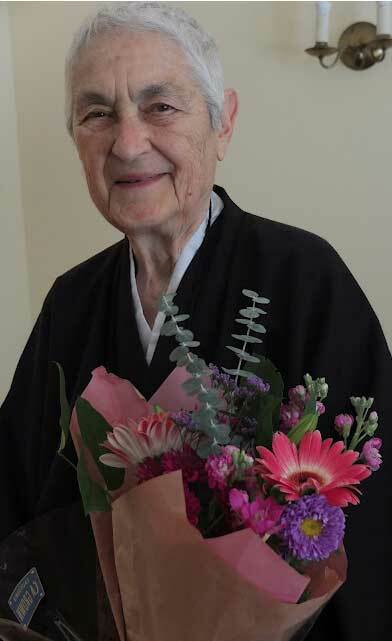 Our memories of Zenkei Blanche Hartman, who died at the age of 90, are deep and numerous. Here we offer a small selection of the vast array of photographs that we have assembled over the years: formal portraits, casual snapshots, and intimate family heirlooms. If you see a photo you recognize, please let us know so we can credit the photographer. If you have a photo that you would like to add to our collection, please leave a comment below. 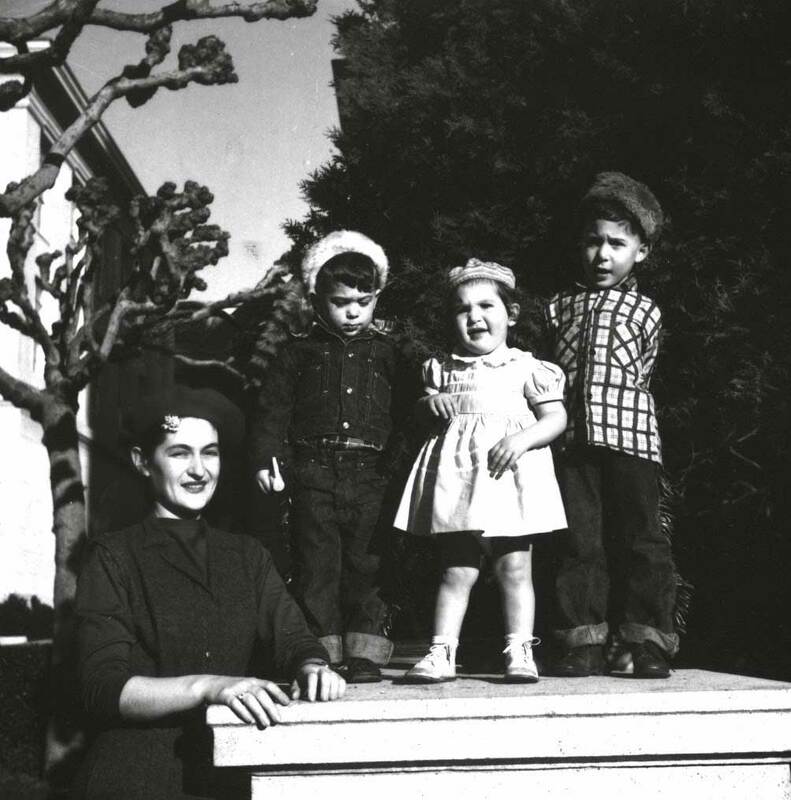 With her children Earl, Trudy, and Joe, c. 1956. Blanche and Lou in 1962. At Rinso-in, preparing for takuhatsu (traditional monk’s begging round). Sala Steinbach is on the left, Hoitsu Suzuki on the right. 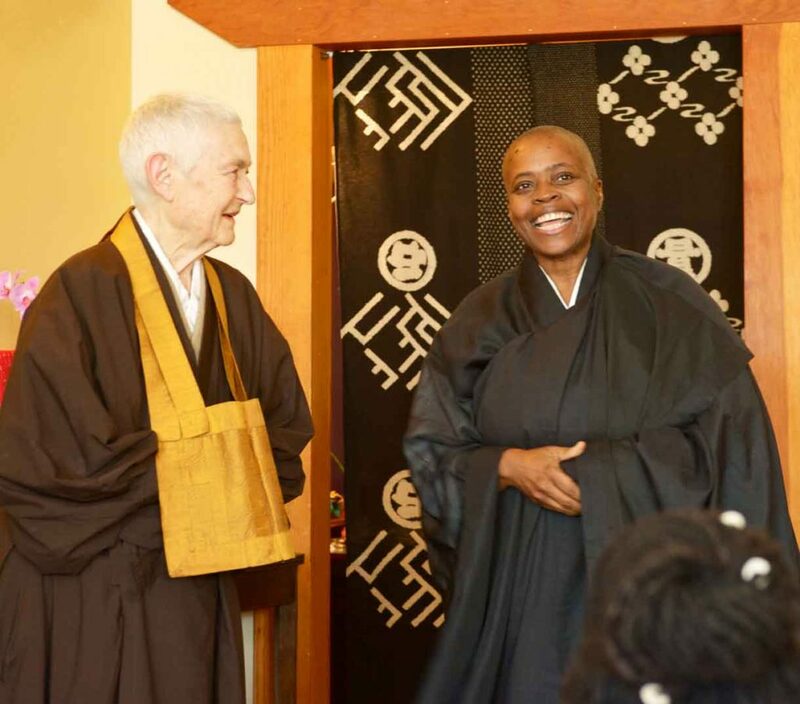 With her student Zenju Earthlyn Manuel in April 2014. 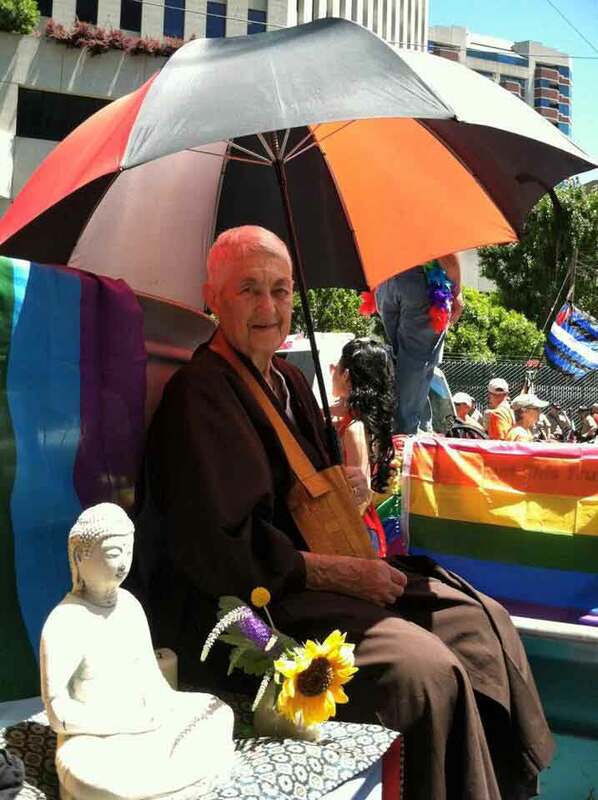 Blanche on the Zen Center float at the Pride Parade. 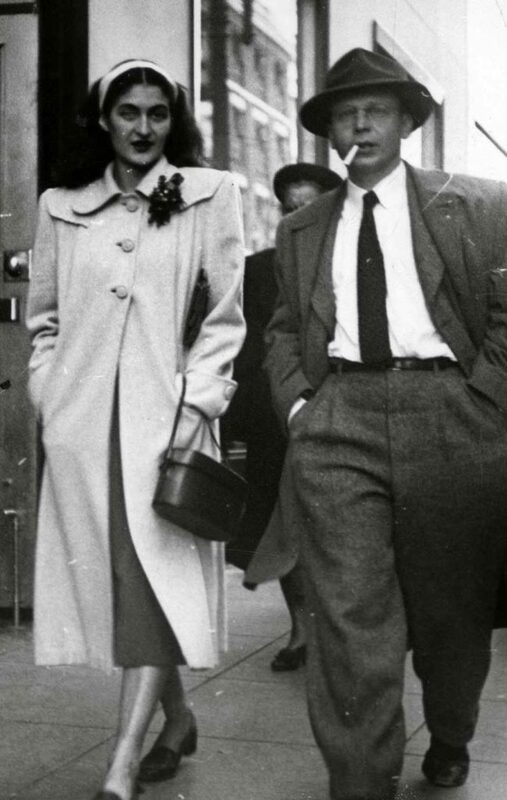 Blanche and Lou snapped by a street photographer around 1948. Lou has obviously just cracked a joke. 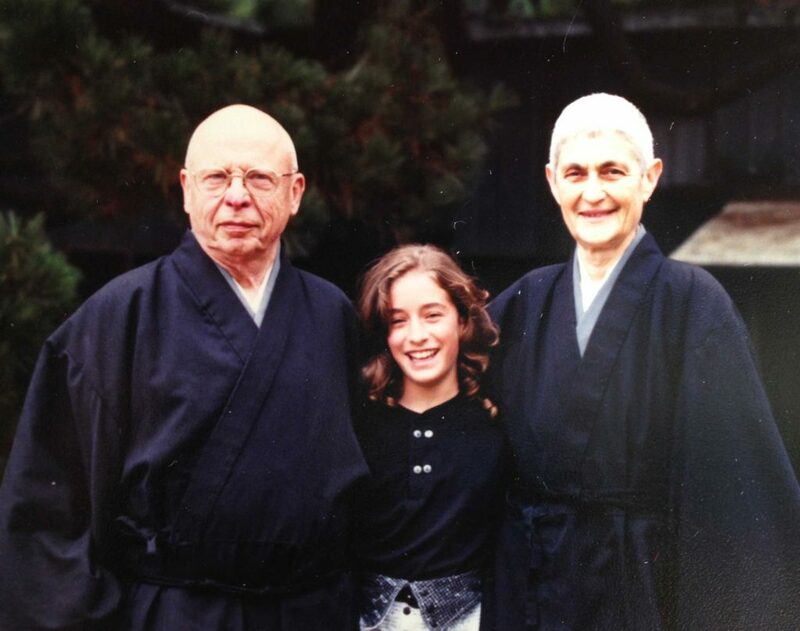 Lou and Blanche with granddaughter Rebecca at Green Gulch, c. 1987. Blanche and Lou. Photo by Renshin Bunce. Blanche and Lou in the courtyard at City Center in 2000. Photo by Shundo David Haye. 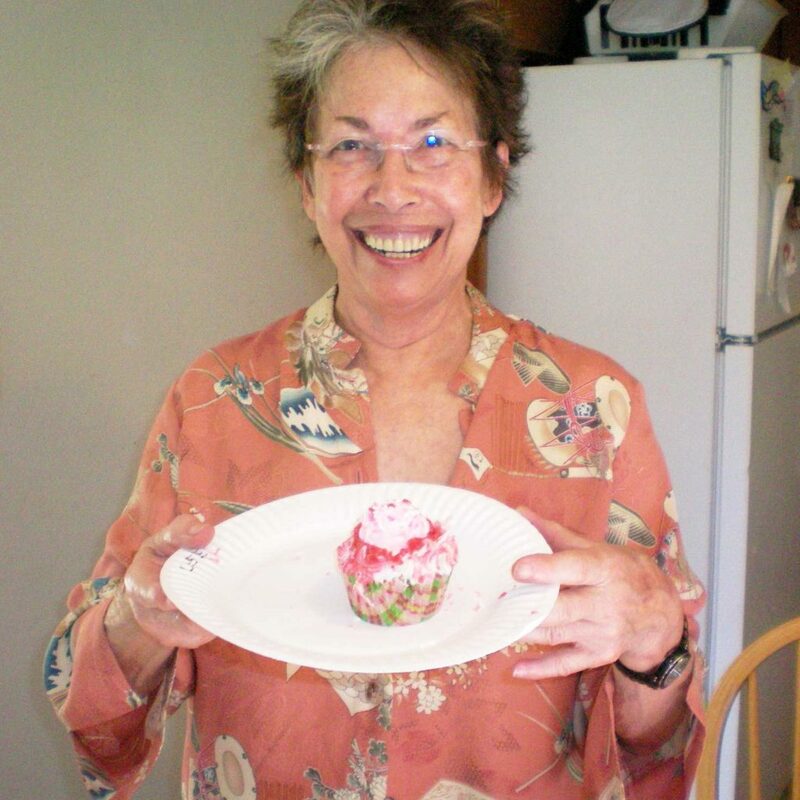 On her 85th birthday in 2011. Photo by Shundo David Haye. 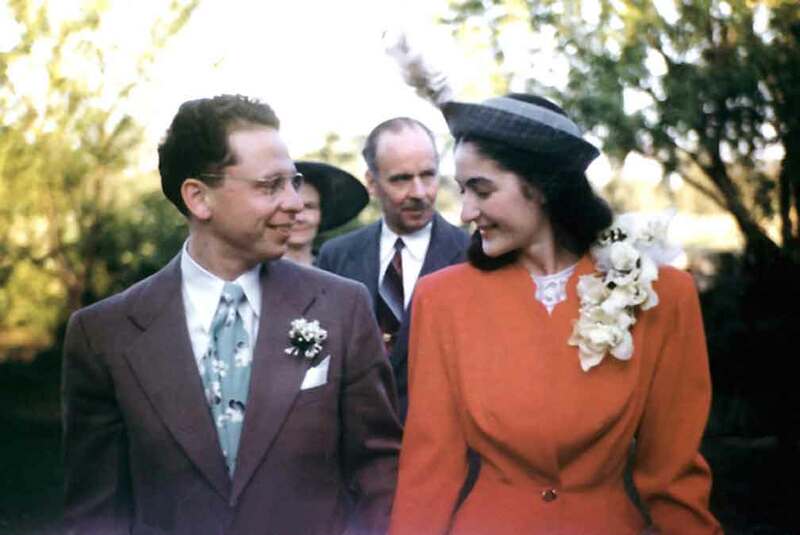 Lou and Blanche Hartman on their wedding day. For the last three days, through the weekend, many people have been sitting with Blanche’s body in the Buddha Hall at City Center. Day and night, members of her family, residents, and students who traveled from all over the country to be here sat quietly with their friend, mother, teacher. At 7:30 am this morning, the body was taken to the crematorium. 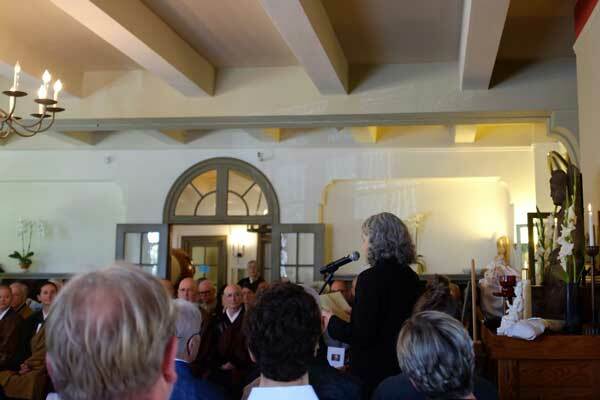 More than 50 people stood in the hallway and on the sidewalk to bid her farewell. As the vehicle moved away, some bowed in the traditional farewell gassho and some waved their hands and said, “Bye, Blanche!” The cremation will be a private ceremony on Tuesday morning at 11 am; everyone is invited to attend the full memorial service in early July, approximately 49 days after her death. For the next 49 days, there will be a memorial service at City Center every seven days on Fridays.